Depending on the type of event that you will be hosting at our South Coast event venue, you will want to choose between a variety of different food options for your reception. Wedding receptions, birthdays, anniversaries, and corporate events in Swansea all have different styles and needs when it comes to the food. That’s why Venus de Milo offers such a wide selection of options for our customers so they can treat their guests accordingly. If you are working with our team to plan a party in Swansea, make sure to go over your ideas for banquets and catering as soon as possible. 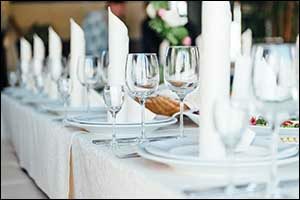 Which type of dinner service is best for your event? When discussing catering options for receptions at Venus de Milo, the number of guests, the time that you have, and the food that you want to serve will play a role in your decision-making. There are definite pros and cons for each type of food service, so it’s best to consider all of the factors before making a selection. Most Cost-Effective Solution – BUFFET – Requires less staff, lower costs overall, guests gain access to a variety of food selections and options instead of having to choose between two entree items. Best Way to Serve Everyone At Once – PLATED DINNER – Staff delivers food to everyone at the same time, making it easy to keep all guests engaged and make sure that no one feels left out; great for expediting the dinner portion of the event. Most Formal Type of Dinner – PLATED DINNER – If you want to “wow” your guests, go with the plated dinner; excellent for corporate events in Swansea, as well as wedding receptions and formal dinners. Most Casual Type of Dinner – BUFFET – For casual, laid back family-style dinners, including birthdays and other special occasions for close friends and family members, consider the buffet. Best Way to Please Everyone – BUFFET – Select a wide range of options for those who are gluten-free, dairy-free, vegetarian, vegan, etc. Make sure to also include a lot of side dishes, carving stations, and options for beverages. Work with our staff to plan a party in Swansea or any other type of event. We can help you make the best choices for your family, personal, community or corporate events in Swansea at our South Coast event venue. We have a wide range of catering options for receptions that you can use to your advantage based on your schedule, budget, and the type of event that you are hosting. For over 60 years, Venus de Milo has earned a solid reputation for providing award-winning cuisine and outstanding service at an unmatched value. Whether you are hosting an elegant wedding celebration, a corporate event, baby shower, or another type of special occasion, our staff will help you to make your time at our South Coast event venue memorable. We can help you host a cocktail reception with a variety of stationary and passed hors d’oeuvre cocktails to your guests. We can create a custom package designed specifically for your tastes that will be ideally suited for you and your guests. You can also choose from our Deluxe Dinner Entrees for memorable plated meals. All dinners include our famous Venus de Milo Minestrone Soup, your choice of starch, vegetable, dessert, and coffee and tea service. Select dishes from menu items that include our famous Venus Chicken de Milo, Marinated Portuguese Steak, Baked Boston Scrod and our Signature New England Lobster Casserole or Pot Pie. We also offer our renowned Lobster Entrees and Duets, including surf and turf or steamed Maine lobster at market price. Desserts range from cakes to ice cream, specialty options, and dessert buffets, depending on your tastes. For those who like a buffet, you’ve come to the right place. When considering catering options for receptions, our South Coast event venue has a wide variety of signature buffets available for our guests. Our buffets include a carving station, pasta dishes, rice pilaf, chef’s vegetables, tossed green or Caesar salad, and assorted dessert items. Ranging between the Standard buffet, which includes options for turkey, pork, chicken, and ham; to the Venus buffet, which features Prime Rib of Beef and Sauteed Lobster, your guests will be impressed. We also have a variety of ethnic buffet options, as well as ethnic plated menu items for our guests. Choose from Asian with Chinese Pork Roast and Thai Chili Chicken; Spanish with Pork Empanadas and Swordfish with Mango Salsa; Italian with Veal Parmigiano and Stuffed Boneless Chicken Breast; or Portuguese with Batata Assada and Arroz a Portuguesa. 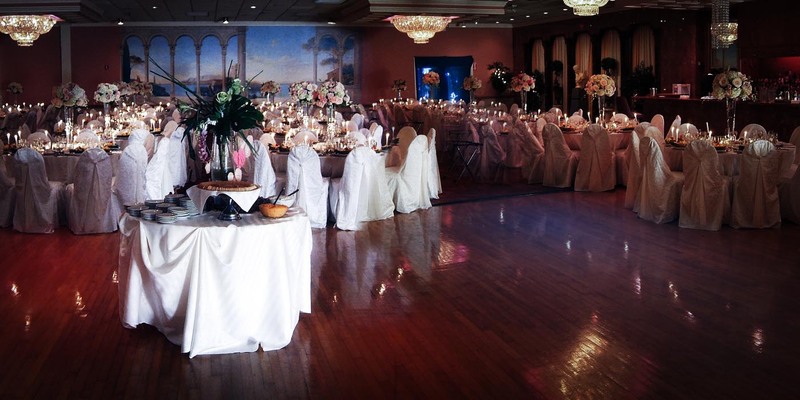 Each ethnic option has several entrees, starches, vegetables, and dessert options to choose from to create the perfect meal for your wedding, party or corporate events in Swansea. Visit the world-famous Venus de Milo and take a tour of our beautiful ballrooms and taste our amazing food when you plan a party in Swansea at our venue. If you are interested in learning more about our catering options for receptions or if you want to check on availability, you can contact our team by calling 508-678-3901. We can answer any questions you have about our South Coast event venue or help you schedule a tour of our facility.